A recent The Way to Happiness tour to India by Dr. Anju Mather found enthusiastic reception of The Way to Happiness, from both students and government and public officials. 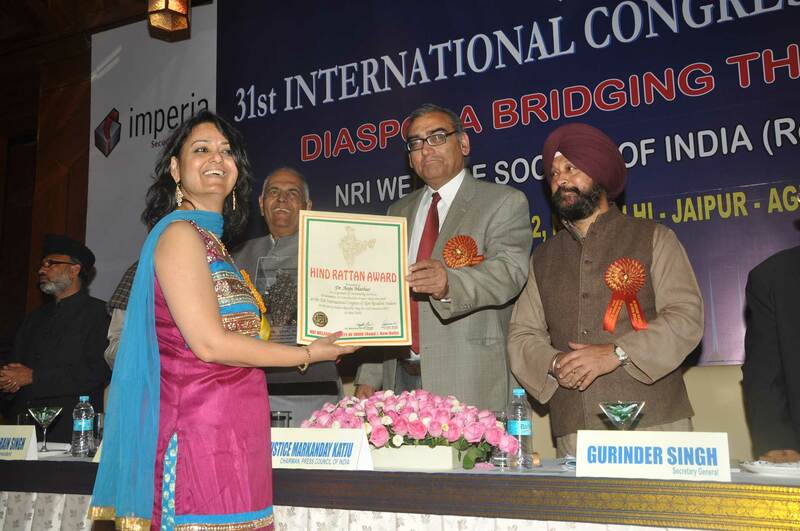 In the above photo you can see Dr. Anju Mather being presented with an award for her work in bringing The Way to Happiness to students, police and government organizations in India. Working with The Way to Happiness Foundation India, The Way to Happiness seminars were held for police officials from two different zones of Delhi. Police officials received their own copies of The Way to Happiness booklet as well as the full Book on Film. Police there found immediately applicable material in The Way to Happiness that they can apply in their daily work. The Commissioner of Police for the Special Police Unit for Women & Children of New Delhi expressed sincere appreciation for the seminars delivered to them, in an official letter issued to The Way to Happiness Foundation India. Additionally, multiple seminars were held for students at a variety of schools in New Delhi. Major India newspapers “Hindustan Times Live” and “East Delhi” prominently featured The Way to Happiness seminars being held in schools and colleges. Here you see students at the Kendriya Vidalaya, R.K Puram School with Dr. Anju Mather after a successful seminar on The Way to Happiness.